Zoinks! The live-action adaptations of the Hanna-Barbera cartoon will be released as a double feature in November. Warner Brothers is planning to release 'Scooby-Doo/Scooby-Doo 2: Monsters Unleashed' on Blu-ray on November 9. The family films star Freddie Prinze, Jr., Sarah Michelle Gellar, Matthew Lillard, Linda Cardellini, and Rowan Atkinson. 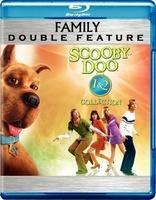 The Blu-ray will feature 1080p video, a Dolby Digital 5.1 soundtrack, and supplements include: Filmmakers Commentary; Cast Commentary; Behind the Scenes Featurettes; Additional Scenes; Triple Threat Featurette – Scooby gives an inside look at stunts, sets, visual effects; True Ghoul Hollywood Story; Dancing Dog – Includes a dance lesson on how to dance like Scooby; Music Videos; and Deleted Scenes. You can find the latest specs for 'Scooby-Doo/Scooby-Doo 2: Monsters Unleashed' linked from our Blu-ray Release Schedule, where it's indexed under November 9.